Austrian rabbi and author; born Oct. 2, 1813, at Glocksdorf, Moravia; died at Budapest April 6, 1882. For some years he was tutor in Hebrew at the University of Lemberg; then officiated as rabbi at Osviecin, Galicia, and Kosten, Moravia; afterward he went to Vienna, where he founded a real-gymnasium, which had but a brief existence. Later he lived for a time at Neuhäusel, Hungary, and finally at Budapest. 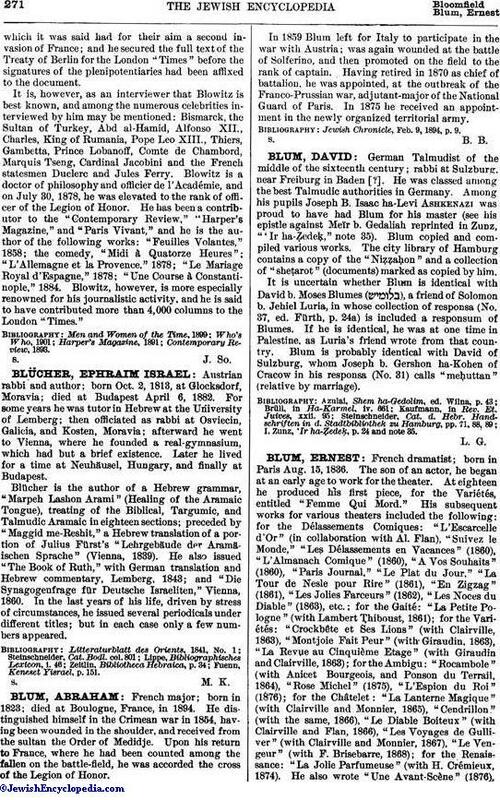 Blücher is the author of a Hebrew grammar, "Marpeh Lashon Arami" (Healing of the Aramaic Tongue), treating of the Biblical, Targumic, and Talmudic Aramaic in eighteen sections; preceded by "Maggid me-Reshit," a Hebrew translation of a portion of Julius Fürst's "Lehrgebäude der Aramäischen Sprache" (Vienna, 1839). He also issued "The Book of Ruth," with German translation and Hebrew commentary, Lemberg, 1843; and "Die Synagogenfrage für Deutsche Israeliten," Vienna, 1860. In the last years of his life, driven by stress of circumstances, he issued several periodicals under different titles; but in each case only a few numbers appeared. Fuenn, Keneset Yisrael, p. 151.